Detecting if your cat is in pain can be challenging. This video features Dr. Margie Scherk , a leading authority in Feline Medicine. She will describe what symptoms to watch for. Cats can be very sensitive to certain types of pain medication such as non steroidal anti-inflammatory meds. But these drugs can be given cautiously for short periods of time. We also use narcotics such as Buprenex to help relieve pain. Massage, acupuncture and spinal manipulation are very useful to help relieve chronic pain such as arthritis. 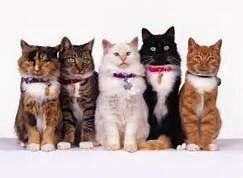 So if you suspect your kitty is hurting speak to your veterinarian to see what options are available to help. Can you tell which kitty is sick? Almost impossible to tell from a photograph but many loving, concerned owner’s miss early or subtle hints that their cat has an illness – especially ongoing conditions like thyroid, kidney and dental disease. Domestic cats have been referred to as having "one foot in the wild." Wild animals, as a survival method, have to hide signs of weakness, pain or disease. Cats commonly suffer from a number of very treatable conditions as they age. Early detection is key to maintaining quality of life in older cats This means that you have to be that much more observant of your feline friend’s behavior at all times. Eating or drinking more or less than normal can potentially signify disease. If you notice a change either way, you should notify your veterinarian. There are countless diseases that can cause an increased thirst, overeating or losing one’s appetite. You vet’s job will be to investigate why. A foul odor coming from your kitty’s mouth can mean gum disease or tooth decay. Brushing your cat’s teeth is a good way to decrease those risks. Imagine if you went 5 or 10 or 15 years without brushing your teeth! In addition, breath that smells like ammonia can be a sign of kidney disease. Causes of this annoying habit can be behavioral or indicate a disease. Discuss your pet’s symptoms with your vet to rule out a bladder infection or urinary blockage before treating this as a behavior issue. Weight loss can be an indication of many diseases and is sometimes the only symptom your kitty will give of not feeling well. Weight gain if it results in obesity is detrimental to your pet’s health. It can lead to diabetes and arthritis. If your normally social kitty suddenly becomes antisocial, there may be a medical reason. A classic sign of illness is hiding: kitty feels bad, tries to hide from “predators” and hides in a closet or under a bed. Lack of grooming can cause dull or greasy hair coat, which can indicate skin disease or other problems. Some cats over-groom and end up with bald patches. Skin parasites, like fleas or mange, or even stress can cause this behavior. A sudden increase in activity level in a middle-aged to older kitty can indicate an overactive thyroid. If your kitty seems less than enthusiastic about moving around or playing, it may indicate arthritis or other issues. If your cat seems to sleep all day when he used to be active, he may be trying to tell you he doesn't feel well. The opposite is also true. If your kitty is up all night roaming the house, vocalizing, or seems overactive during the day, there might be an underlying cause. A change in your cat’s routine may be a sign of stress. Changes in the environment your pet lives in, like the addition of another pet, remodeling or loud noises can all cause hiding, depression, or a lack of appetite. Be objective and thorough when describing any potential changes to your veterinarian. Normally quiet cats with an increase in vocalizations, or a usually chatty kitty which suddenly becomes quiet, might mean trouble. Any of the above changes, whether slow or quick, is a reason to see your veterinarian to investigate the cause and find a treatment as soon as possible.